Designed with improved efficiency and cooling systems that reduce energy usage in your datacenter. IBM's previous generation of products for AIX® and Linux®clients. Replaced the entire family of the i5 servers and older AS/400 product lines. Bytek specializes in refurbishing IBM, HP/Compaq, Sun/Oracle and Dell hardware, and purchases surplus hardware from companies worldwide. Bytek services include immediate quotations to supply refurbished hardware, value assessments on surplus hardware, 3rd party maintenance quotations, asset management, leasing options and certified training partnerships. Bytek will assist your company by providing quality refurbished computer and telecom hardware at 30-80% below new list price. Bytek will purchase your surplus computer and telecom equipment offering top dollar for you end-of-life assets. Bytek has a nearly 100% repeat order rate. Our customers keep coming back! Bytek Corporation is an independent reseller of computer hardware and telecom equipment. Celebrating 10 years of service in 2010, Bytek has assisted companies worldwide in reducing their IT and telecom expenses. Bytek is a small group of seasoned IT professionals with many years of experience with IBM, Sun/Oracle and HP/Compaq experience. We are dedicated to provide our customers with fast, reliable service with excellent post sales support. Located in Eden Prairie, Minnesota, Bytek services customers worldwide. We have shipping expertise from Asia to South America and all points in between. The issues that come up at your datacenter are not uncommon. Only in a perfect world could a business afford the latest server technology refresh every year. Bytek has experience working with our customers who experience budget restraints due to growth and consolidation issues. Our services and dedication will deliver cost savings and streamline your datacenter, in a safe and affordable manner. Bytek has proven success in providing solutions by streamlining and integration of disparate systems. Our asset management service will take the burden away from internal issues of accounting for end-of-life IT and telecom assets. Free up valuable floor space and allowing your business to better focus on the future of your data center, not dwelling in the past. 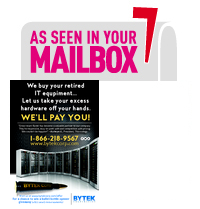 Let Bytek manage your decommissioned IT hardware and Telecom equipment. Contact us today with a list of your IT and Telecom assets. A fully scalable system using an IBM iSeries, pSeries, high-end Intel System x servers or data storage system will allow growth at a scalable rate. This allows you to include additional server technology as you grow, with minimal interruption. Bytek can assist with your planning to ensure success as your IT requirements change. Move forward with confidence with the Bytek team at your side. Gains in performance are a key reason in making improvements in your datacenter. Launching a virtualization system can increase server utilization. Maximizing your network capacity eliminates bottlenecks and downtime. Employees will find their time and energy will not resolve around maintaining their IT structure. They can focus on customer service issues, rather than technical problems. Our goal and dedication is in providing you savings in purchasing IBM Server systems and reducing your maintenance costs. Deep cost savings mean your business assets can be stretched further. Bytek can provide same day quotations for your datacenter refresh project or maintenance solutions. Bytek can help you build a centralized database and a common platform. Consolidate all of your business operations into a uniform and enterprise-wide system environment. Plan for the future by utilizing a realistic budget with cost saving measures. Bytek will work with your budgetary demands, and can provide multiple financing alternatives to make your purchase as easy as possible. Bytek Corporation and its staff are committed to the highest level of technical standards within the industry. All IBM products provided by Bytek Corporation are guaranteed to be eligible for IBM maintenance. In addition, complete systems can be recertified and banded by IBM, allowing for secure installation with no-risk or complications. Custom Configurations to meet your technical specs. Bytek Corporation will purchase your existing equipment or accept trade-in offers. All equipment is guaranteed eligible for IBM maintenance.